Hear vivacious, Afrobeat-infused music from a sibling duo celebrating and sharing the culture of their war-torn South Sudan home. 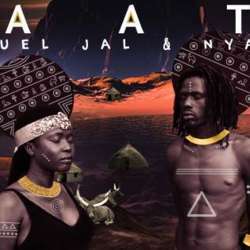 Emmanuel Jal and his sister Nyaruach released joint album Naath in Protected content . Together, they make music that draws on the unique sounds of their country, interweaving traditional folklore and love songs – alongside infectious dance tunes. Creating music at odds with the image of war and poverty that has blighted South Sudan, Emmanuel and Nyaruach started recording together in Protected content break-out single ‘Gua’, ‘peace’ in their native Nuer tongue, which was broadcast by the BBC across Africa and became a hit in Kenya in Protected content . A former child soldier in South Sudan, Emmanuel has come through huge personal struggles to find success as a recording artist and peace ambassador. Naath is his sixth studio album, and he has performed with artists including Lauryn Hill, Peter Gabriel and Alicia Keys. His charity Gua Africa supports those affected by war and poverty in South Sudan. Nyaruach is a spokesperson for women’s rights and education in South Sudan and Africa as a whole. She was separated from her immediate family at the age of 4. As the war intensified, she witnessed her family members killed and was raped by government officials. It wasn't until Protected content she was finally reunited with Jal in Nairobi.